Not since 1995 had a TBM Avenger flown over Oahu, Hawaii, and this time it was a homecoming of sorts because BuNo 85828 was stationed there in 1945 and ’46. It was a crazy idea—taking a TBM from Illinois to Hawaii. Getting there was quite a story. Sometimes overlooked because it was arguably obsolete at the start of World War II, the P-36 Hawk was a rugged and reliable aircraft that was the basis for its more famous sibling, the P-40. 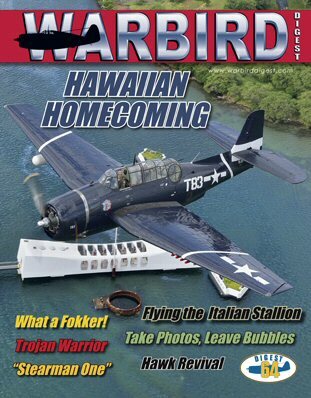 Frank Mormillo has the scoop on the recent P-36 Hawk restorations. Exhibiting an impressive collection of boastworthy attributes, the Siai Marchetti S-211 is a rarefied trainer that first befuddles a warbird devotee’s visual identification skills, and then earns respect and admiration as an economical high performance jet trainer. Step back in time at the Golden Age Air Museum, where the mystique of World War I aerial combat comes to life through the museum’s Fokker Dr.I Dreidecker. It is a flying tribute to the brilliance of designer Anthony Fokker and WWI German Ace Lothar von Richthofen. Underwater wrecks are popular among scuba divers and Kwajalein is rich with opportunities. The photos of barnacle-encrusted warbirds inspire historians and warbird lovers, yet the excitement is tempered by the knowledge that lives were lost through the tragedy of war . A group of dedicated divers have transformed a hobby into a noble mission.